“No one can get inside the head and heart of a 13-year-old girl better than Carol Lynch Williams, and I mean no one," said James S. Jacobs, Professor of Children's Literature at Brigham Young University, of her breakout novel, The Chosen One. Now this award-winning YA author brings us an equally gripping story of a girl who loves her mother, but must face the truth of what life with that mother means for both of them. My Thoughts: Miles from Ordinary was an extraordinary novel. I also read The Chosen One, I did like the Chosen One a bit more but Miles From Ordinary was a good novel. We are introduced to Lacey who is only 13 years old. She lives with her mother and basically takes care of her. She doesn't get out much so when she gets a job at the library while her mother also gets a job at the store, she is thrilled. She thinks it will be good for her mother to get out and do something. Lacey's aunt used to work at the library so Lacey is happy to be doing something her aunt was happy to do. Her aunt left a while ago after her mother told her to get away. Lacey also meets a sweet boy who takes the journey with her. He understands things pretty good for not knowing Lacey too well. When Lacey gets off work the first day, she can't find her mom. She looks and looks, finally her aunt comes, and things go from there. I can't say much more or else I'll give the whole plot away. Honestly, this book was very emotional and a quick read, just as The Chosen One was. It was a very gripping story of her families troubles and her mother's illness. 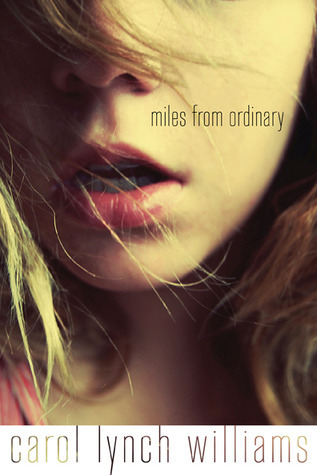 Overall: I really liked Miles From Ordinary. It was very emotional and made me tear up a few times. Its not a book to be taken lightly. Cover: Like it. Its a emotional cover even though there isn't much to it besides the girls face.